The United States Concealed Carry Association (USCCA) brings its 2nd Annual Concealed Carry Expo to Atlanta, GA, along with a lineup of world-class trainers and 2nd Amendment supporters. 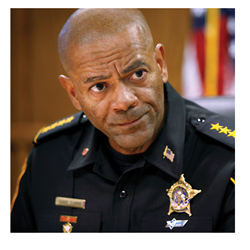 Headlining as the Expo’s opening keynote speaker, Milwaukee County Sheriff David A. Clarke Jr. will speak at 2:30 p.m. on Friday, April 29th, just before the show opens. Guests will have the opportunity to meet Sheriff Clarke in the USCCA booth immediately following his speech. The Expo also welcomes Lt. Col. David Grossman. Grossman is a former U.S. Army Ranger and West Point psychology professor and is recognized as one of our nation's leading trainers for all branches of the U.S. Armed Forces, U.S. Federal Agencies and law enforcement. Grossman will give a special four-hour presentation of his highly acclaimed program, “The Bulletproof Mind,” on Saturday, April 30th at 9:15 a.m. Attendees planning to attend this event must pre-register at http://www.concealedcarryexpo.com. Other guest speakers and trainers already confirmed for the event include Dave Young, Founder and Director of Arma Training, who will conduct seminars on weapons retention, firearms survival tactics and preparing for a gunfight. USCCA contributing writer Beth Alcazar will lead a presentation titled “Why Women Hate Guns: Encouraging Women To Accept, Own & Use Carry Firearms.” George Harris, co-founder of the SIG Academy, will address the topic of choosing the best firearms suited for everyday concealed carry. View the full seminar schedule and guest speaker lineup on the Concealed Carry Expo website here. The 2016 USCCA Concealed Carry Expo is the industry’s only event dedicated to the concealed carry lifestyle. The event is completely supported by the USCCA and contributing sponsors. With more than 125,000 members/subscribers, the USCCA is the fastest-growing advocate for concealed carry and the industry leader in self-defense insurance. For more information, visit the Show Website: http://www.concealedcarryexpo.com/. The U.S. Concealed Carry Association (USCCA) is the first and largest, member-owned association designed to educate, train and insure responsibly armed Americans. USCCA members receive access to a wealth of industry information and insurance protection through its Self-Defense SHIELD program. The USCCA also provides expert advice, product information and the latest news centered around the concealed carry lifestyle via email, social media, Concealed Carry Magazine and their nationally syndicated radio program, Armed American Radio.